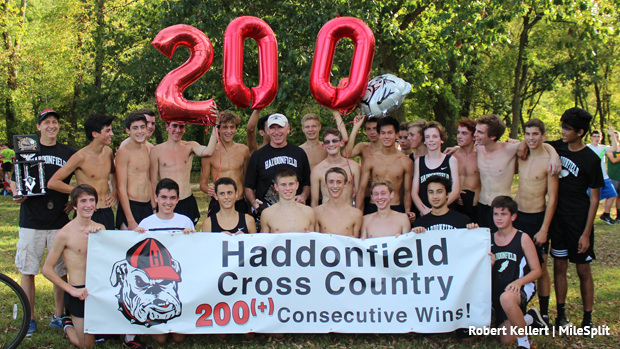 On Tuesday afternoon the Haddonfield Memorial cross country boys hit a historic mark for the program, passing 200 straight dual meet wins. A streak that has remained intact since 1997. Head Coach Nick Baker has been there for that entire time span and more, amassing 320 wins since he took over the coaching duties in 1982. The wins came in a quad meet with Audubon, Collingswood, and Haddon Township. Andrew Gostovich led the meet with a time of 17:14 and then a wall of haddonfield black and white followed him across the line. Also in their top seven: Griffin Weiner, Derek Gess, Greg Eisenhower, Martin Riddell, Ethan Spellmeyer, and Sean Campiglia. Haddonfield crossed their top 11 before the rest of the field scored an athlete. Outside of the hard work and training at the high school level part of the sustained success may be linked to the start of the middle school program in 1997. Baker started that team as a way to expose young talent to the sport and team before the high school ranks. Haddonfield's win streak is the second longest active streak in New Jersey with Christian Brothers Academy at 354, their wins dating back to 1974. Haddonfield has had a strong start to the season outside of duals as well. They recently had a solid second place finish at Bowdoin Park where some top ranked teams and athletes were in competition. Our most recent state rankings poll has the Haddonfield Dawgs second in the state, only behind top ranked Christian Brothers Academy. You can watch views from the boys race here, and we also held an interview with senior Richie Glennon on the historic mark as well down below.